LOW MILES - 62,371! Laredo trim. 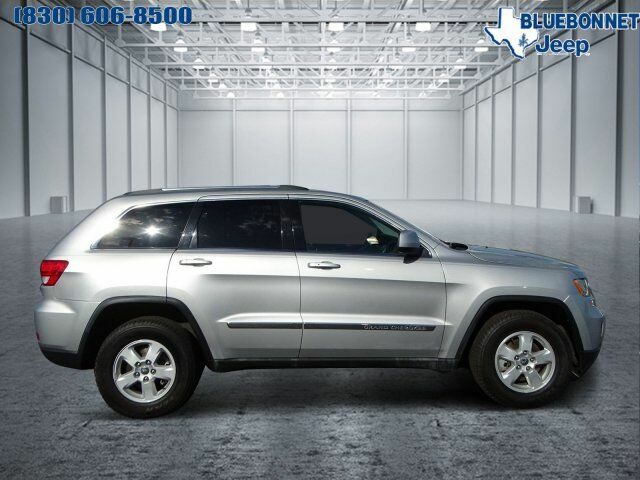 CD Player, iPod/MP3 Input, Dual Zone A/C, Keyless Start, 3.6L VVT V6 FLEX-FUEL ENGINE, 5-SPEED AUTOMATIC TRANSMISSION, Satellite Radio, Aluminum Wheels. CLICK NOW! Satellite Radio, iPod/MP3 Input, CD Player, Aluminum Wheels, Keyless Start, Dual Zone A/C Rear Spoiler, MP3 Player, Keyless Entry, Privacy Glass, Child Safety Locks. The Grand Cherokee offers more 2nd Row Leg Room than Honda Pilot and Toyota 4Runner. You will also get More Highway and City Cruising Range Miles than the Ford Flex, Ford Explorer, and Honda Pilot. With 35.1 cubic feet of Cargo Volume (behind 2nd row), the Grand Cherokee will accommodate the equivalent of 5 carry-on suitcases and 2 sets of golf clubs.